Bernanke’s napping on the job crashed the planet towards the end of Bush’s administration and job losses continued into Obama’s administration. There’s some lag as to when things take effect. You know… I often ear that lag explanation, but it’s generally coming from someone trying to vindicate their “team”. I tend to believe it, because it seems common sensical that the government’s actions won’t have an immediate effect on jobs. However, now that I think about it afresh, I’m wondering what (if any) data there is to back up that statement. I understand Matthias’ “correlation does not prove causation”, so I don’t want to read too much into the trend in the graph. But am I to assume that the economy skated along on its past strength for 18 months under a Democratic Congress before the policy of the Bush administration / Bernanke resulted in millions of lost jobs? Conversely, how would we explain the upswing 9 months after Republicans gained control? I am curious how this is displayed over time and what other events affect this? For example, every 8 – 12 years there is a recession or depression. We are coming out of one now, there was one around 2002, there was one in the early 90’s, and there was one in the late 70’s – early 80’s. This chart also shows the time period coming out of one downturn into an upswing and then back into a downturn. How does that play into these numbers as well? I’m confused. I don’t understand the point the chart is trying to make. What I see is more blue than red – and that we’re better today than we were during the early GOP-controlled Congress days where your chart begins. Is that your argument – that Dems are better at creating jobs and the Republican talking points of low taxes relieving burdens on businesses to generate job growth is all a hoax? Please don’t be childish in my comments section, it’s insulting to your own intelligence. I’m very sorry if I offended, but I meant my comment as an honest question. You said you have more to say later, so if you’re not interested in entertaining a serious question, I’ll have to wait until then. If that is the case, I apologize. I read your comment as a snarky attempt to willfully misread the graph. 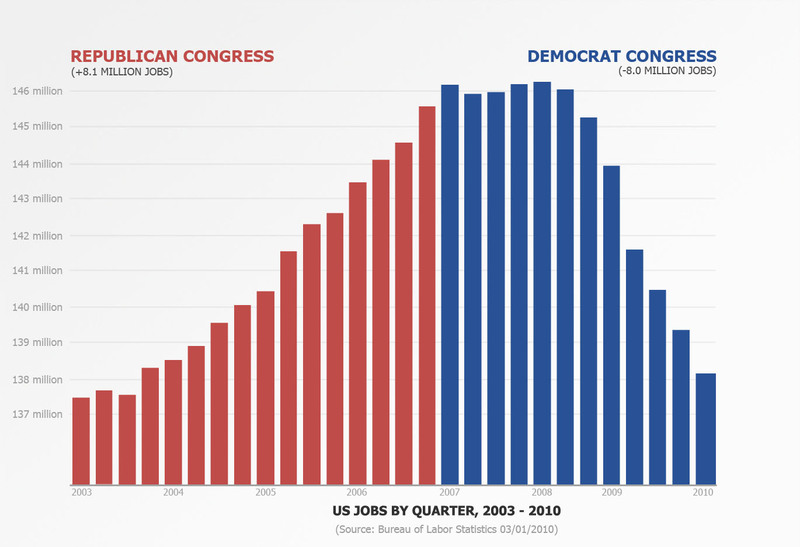 The chart is meant to show the number of jobs growing throughout the Republican controlled time in Congress. We then see job growth stall in the first year of Democrat control of Congress and then see nearly all the gains made during the Republican years wiped away. I’ll be discussing this chart and what it means in far more detail in the next couple days. Thank you for being patient with me and, again, I apologize for my hard words. They were wholly unwarranted. Thank you for the kind reply. I’m still not convinced this is a positive visualization for Republicans – which may not be its attempt – but I’m interested to follow what more you say on the subject. Thanks again. I’ve heard many times over the last few years that the jobs that were created over the past ten years were lower-quality jobs. People have been underemployed, working below their experience level, paid less, or only able to find part-time work. So just showing a count of jobs doesn’t tell the full story. Though I realize how difficult it would be to quantify underemployment. Perhaps it could be correlated to inflation-adjusted income. Use a stacked graph showing proportion of the population in each multiple of the Federal Poverty Line, over time? I agree with Matt’s belief that the time frame seems a bit selective, picking the bottom of one recession as the starting point. This might be the cause of Sarah’s confusion, since it may look like we’re just returning to a baseline. Sarah, what the graph is showing is the trend, under Republicans jobs grew and under Democrats we have a negative derivative, meaning that jobs are shrinking. I tend to believe that neither party is particularly good at “job creation” and that on a longer time frame you can find jobs being created and lost under both tenures. HOWEVER, the graph works well as a response to the Democrat’s dogmatic instance that Republican policies favored only the rich. After all, how much of that job growth benefited middle and working class families? I would guess a lot. I wonder what the distribution is between the creation of jobs in the private and government sector. So, what happens when libertarians control congress? I want to see some data about job creation for that. This is interesting, but it would be more interesting if the data were longer term, e.g., over 28 years instead of 28 quarters. The basic premise “Does a Republican Congress Create More Jobs?” is flawed. Congress does not create jobs, at least not the kind that actually generate wealth. I second Erika’s comment that a longer term would have been more interesting. Furthermore, I think differentiating between the Democrats and the Republicans is not useful. It would be more interesting to examine ‘Size of Government -vs- Jobs’, ‘Number of Regulations -vs- Jobs’, ‘Level of Taxes -vs- Jobs’, etc. Even then, you have to recognize that the nonlinearity of the economy does not lend itself to teasing out sensitivity to individual parameters. I’ve truly enjoyed your blog over the past year, but this line of thought appears to me to be starting out poorly. I’m interested to see if you can salvage it. Having data charted over a longer time frame would be nice but, unfortunately, there’s only been a few years within our lifetimes when the Republicans had control of The Congress. Frankly, this seems like fighting misleading information with misleading information. But it is useful in the sense that any objection raised by a Democrat against your graph can also be applied to their graph. Nicely played. Al: The Republicans were in charge of Congress 1995-2008. The graph goes from 2003-2010, so there’s twice as many years with a Republican Congress than the graph shows. Jobs did rise during the latter Clinton term. Then they dipped during the 2001-2002 recession. Then they started rising again. One theory that I’ve heard before is that the economy gets nervous when the White House and both houses of Congress are all controlled by the same party (e.g. 2001-2002). Neither party has better policies than the other (at least as far as the economy reacts to), but without adequate checks and balances, both parties are capable of passing their half-baked pet policies into law. The Republicans were in charge of the House of Representatives from Jan 1995 through Jan 2007, not the entire Congress. Democrats controlled the Senate Jun 2001 through Nov 2002, when the Repubs regained control with 50 members plus the vote of President of the Senate Cheney. I like most of your charts/videos (and have done posts on many of them as well) … but the sample section is way to small here. Unless you are trying to say that had the Republicans remained in control we would have avoided the recent bust, you need to go back at least a few decades if not a full century. Your blog and the articles I’ve read here are of great value. Thank you for the time invested in this blog. Let’s see… at the end of 2006: unemployment was 4.6%, prior GDP growth was +3.5%, & the DOW was at 12,621.77. George W. Bush with a Republican Congress set a record of 52 straight months of job creation. Progressive-controlled Democrats took majority control of Congress starting January 2007. Their political allies expressed desires to socialize America in the name of social justice and equality. The economy must be looked at partially psychological. If you push a massively expensive radical agenda, you will naturally create uncertainty and cause investors to pull back and sit on their money. The outcome of doing so is easily understood by looking at any of the long-term liberal enclaves in many of our cities and states. Bush drove us of the cliff but you want to blame the crash on the democrats? Come on! This is a joke right? The chart shows precisely how the republican administration *ruined* this country. We were living beyond our means, high on the hog. An administration that increased spending, cut taxes; and caused financial ruin. And now we’re paying the price for it with a depressed job economy. The same thing happened during the reagan years. By the time H.W. took over, he had a mess of an economy to deal with. He tried to do the right thing by raising taxes and got booted out in four. People in this country don’t realize they can’t have it all; politicians are afraid to do anything because it’s “political suicide”. How long have we’ve known about the problems with social-security/medicare? For decades, and yet we’re still immobilized. It’s time to nut up people; live within your means, and make the hard choices. The republicans are good at creating money and the democrats are taking it and distributing. I would bet that most republicans have either grew up around successful businesspeople or have run a successful business. The typical democrat probably grew up around some type of take and give without or jobs with no accountability. Take and give would be things like lawyers and charity. Jobs with no accountability would be things like social work, psychology, or insurance. If a social worker does a bad job of babysitting their adult subject they blame it on the adult subject. If a psychologist fails they blame it on the patient or say it is out of their specialty and push onto another psychologist. If an insurance company is about to take a loss they re-interpret the rules to prevent a payout or just increase premiums to make up for the payout. I would be more interested in seeing a graph that went further back in time. 2003 to present is not an accurate representation as the housing bubble alone created jobs. But as we have experienced it was false growth, much like the dotcom bubble of the 90’s. The decline of jobs beginning in 2007 ( based on the graph posted ) is widely believed to be caused by the collapse of the housing market. Taken in context, the graph is showing that the 8.1 million jobs created during the Republican years were, in fact, “bubble” jobs, created by a false rise in our paper economy. ok, some guy said that the picture does not show that people were underemployed or underpaid during the republican era. I say it is better for us to have been underemployed rather than unemployed. Just remember that. If you chart the month to month deltas the chart pops out. Color positive values green, negative values red. You will see all positives with Republican congresses, mostly negatives with Democrat congresses. Iteresting chart what I would like to see though is a chart showing private job creation vs. public job creation rebulican and democrat controlled. I would consider that more revealing than just jobs as a whole. The chart is bias. Its blaming the Democratic Congress for the failed policies of the Bush administration. A better judge would be starting the chart 6 months after a President takes office and going 6 months when they leave office. I think this is how Republicans explain the Recession that started in Ronald Reagans 1st term. They blame it on Carter. If this was the same then George Bush would have lost about 8 million jobs in the recession of 2008 and 2009. Your premise is misguided. The chart is biased, but not for ANY of the reasons you state. And its bias is in its posting, not in its graphical execution. The posting of a graph that fits a desired platform is the bias, as there is a neglect to display contextual information. That is not the charts fault. The chart shows exactly what it shows. The Bush administration, however flawed in their policies, was faced with a Democratic majority in both chambers of Congress after 2006. As the President is not capable of passing budgetary legislation, he/she must veto bills incongruent with ideology(or else allow them). Budget bills originate in the HOUSE…they must be passed by the SENATE…President only has authority to allow or disallow. Much in the same way that Obama is faced with a Republican controlled House right now, Bush was at the mercy of Dem legislation in 2007 and 2008. For Obama, with Reps in power in the House, no budget bills originate unless the Republicans let them. The only difference between Bush’s year after the 2007 democratic congress was swept in and Obama’s current predicament is that the Senate is still controlled by Dems. Dems had free run of the legislative process…Bush could only VETO or not veto. Obama is stuck in a far worse position than Bush. Any pragmatic, non-partisan can see that Bush had no options on legislation…the Dems OWNED the last full year and a half of Bush’s legislative agenda. For Obama, it far worse. Republicans are forced to rely on the singular bargaining chip, their power to originate budget bills, as the only way to get policies they are interested in heard by the Senate. In the current case, Republicans want deep spending cuts, few new taxes, and the new healthcare act revoked. That is basically the general republican platform at the moment. Whether they believe it or adhered to it previously is inconsequential. It is what they SAY they are in favor of currently. As such, Obama can get nothing through the House and is well aware of it. A wise man would accept the position and concede ground on SOME Republican policies. A barter system for example, where Reps get spending cuts but only on defense and government employee pay. In turn, Republicans allow budget measures to pass in the House so as Dems get to up the debt ceiling and invest in stem cell research and further investments in education and infrastructure. Whatever the compromise, it would seem ill-advised to play chicken with the Republicans seeing who will flinch first. Historically, when one party is in charge of the House and the other party in charge of the senate and presidency, the president will work with the House of ‘reasonable’ policy requests in exchange for movement on budget bills. The House party uses their position as the originator of budget bills to force policy they want enacted…policy that wouldn’t be enacted otherwise, due to lacking numbers in the Senate. A stalemate is usually not a welcome scenario for the party holding the executive branch and the Senate, as they have more to lose due to their public exposure. As it is, the recession of 2008 started in late 2006 but signs didn’t show until mid 2007. A true ‘starting point’ can not be pinpointed, but elements can be chided for their role in enabling(if not promoting) a legislative and political culture that guaranteed the 2008 recession would happen. If you are indeed willing to be non-partisan in your studies, a judicious reader can pinpoint policy changes throughout the late 20’s and into the 40’s that had monumental impacts on how our economy functioned. Then into the Kennedy era one can find other financial policies with far reaching implications. Then came Carter and his “Community Reinvestment Act” …this little piece of legislation, a hallmark of his administration played a LARGE role in the 2008 collapse. Houses to those incapable of securing private monies…Fannie and Freddie funneled otherwise unattainable money to the less fortunate so as a house could be secured. How pray-tell does one not able to secure a loan on the private market intend to pay back a taxpayer loan? Well it is would appear to be very difficult, and as of the mid 1990s, with housing prices around the country beginning to rise, damn near impossible. The final nail in the coffin making the 2008 collapse inevitable would be the 1999 repeal of the Glass-Steagall Act. Having been in place since 1933, the repeal would enable Lenders to trade mortgage-backed securities and collateralized debt obligations. So, while the chart isn’t biased, the posting of the chart without context is misleading. The chart simply shows that under a Dem controlled Congress, jobs were lost, compared to jobs created while a Rep Congress had power. Drawing conclusions from such a chart is circumstantial. The real fact is, policy on both sides of the aisle have got us to where we are today. That is an indisputable fact. Regardless of HOW we got here, one element is clear, America can not afford to STAY here. I am convinced several may have taken issue with such a conjecture were the display to go undefined. Misleading, to say the least. FA Hayek once said, “The curious task of economics is to demonstrate to men how little they really know about what they imagine they can design.” It’s pure folly to imagine that Congress or the President has a direct influence on the mechanics of the economy. You’re being fooled by randomness. Наша истина и наше добро только отчасти истина и добро, и они запятнаны злом и ложью.